China has executed 13 people in the western province of Xinjiang for "terrorist attacks", state media say. The 13 - who reportedly include Muslim ethnic Uighurs - were accused over seven cases including attacks in June 2013 that killed 24 people. It comes as three other men - who reports say also appear to be Uighurs - were sentenced over a fatal car crash in Beijing last year. Those executed on Monday had been charged with crimes including "participating in terrorist groups; murder; arson; theft; and illegal manufacture, storage and transportation of explosives", state-run news agency Xinhua said. The report named three defendants who were convicted of attacking a police station, hotel, government building and other venues in Lukqun, Xinjiang province, on 26 June. Also on Monday, three men were given death sentences in connection with a crash in Beijing's Tiananmen Square last October, when a car ploughed into a crowd. Xinhua news agency said Husanjan Wuxur, Yusup Umarniyaz and Yusup Ahmat were guilty of "organising and leading a terrorist group and endangering public security". 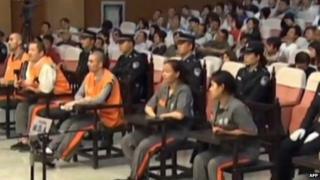 Reports said several of those sentenced or executed on Monday appeared to be from Xinjiang's Uighur ethnic minority, based on their names. Uighur leaders deny that they are co-ordinating a terrorist campaign. Activists have accused Beijing of exaggerating the threat from Uighur separatists in order to justify a crackdown on the Uighurs' religious and cultural freedoms. Correspondents say Uighurs, who number around nine million, have long complained of repression under Chinese rule - an accusation Beijing denies. In May, China sentenced 55 people for terrorism, separatism and murder at a Xinjiang stadium in front of thousands of spectators.